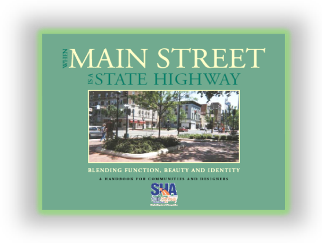 An excellent example of Maryland Department of Transportation State Highway Administration (MDOT SHA) efforts to improve our project development process is our publication, "When Main Street is a State Highway – Blending Function, Beauty and Identity – A Handbook for Communities and Designers." This handbook guides community representatives and MDOT SHA staff through a step-by-step, comprehensive process that allows them to identify and achieve community goals. This publication was recognized by the American Association of State Highway and Transportation Officials (AASHTO) with the President’s Transportation Award for Planning. The field-tested approach outlined in "Main Street" is the result of several years of experimentation with community-oriented projects, extensive MDOT SHA staff give-and-take, and the contributions of many local communities and citizens’ groups. This publication highlights SHA’s commitment to the early, continuous and effective involvement of all stakeholders in our project development process. Our Thinking Beyond the Pavement efforts have done a lot to improve relationships between MDOT SHA and municipalities. While the handbook focuses on the process used in our smaller projects, it is representative of the philosophy that we use for all transportation projects.